It's been several Christmases since the beauty of Mercury glass caught my eye. I don't think I'll get tired of it anytime soon. It's wonderful to use all year round, but it really is beautiful at Christmas with all the lights shimmering off of it. I wanted to keep it as simple as possible this year. 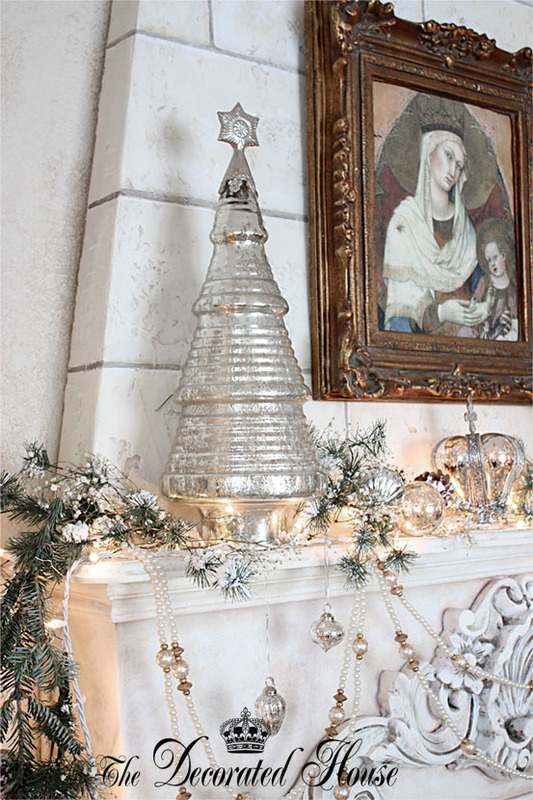 In the past we have enjoyed different traditional Christmas colors in this room and on the mantel, but it is mostly white and silver this time. And lots of tiny lights. 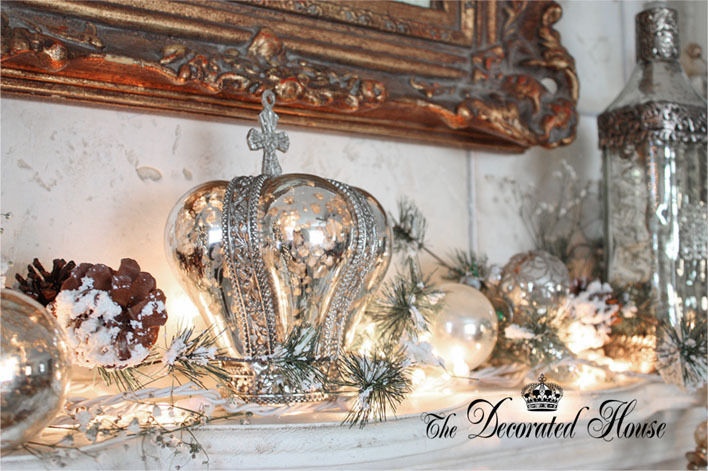 Sometime during the past year I found the Mercury glass crown and the decanter knowing that they would be a welcome addition to the other decorations at Christmas. Still everything else was from years past. Using not only what we had, but using a lot less. If you have been by previously, you probably know this is a faux fireplace with an antique fire insert that we created several years ago. I always love it, but at Christmas maybe just a little bit more. Thanks for stopping by and sharing Christmas. Donna, your mantel is absolutely gorgeous! Love the mercury glass...the shimmer is so pretty! Thanks for sharing! 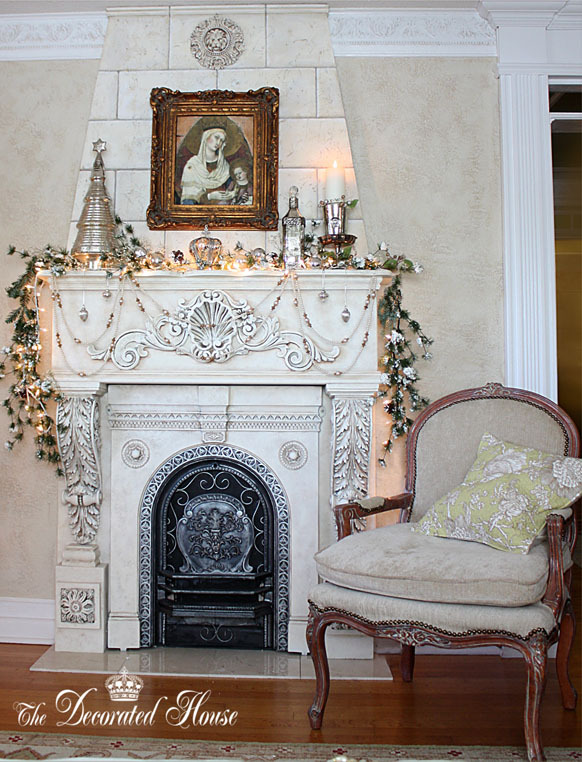 Faux or real, your fireplace is so beautiful, Donna, you really don't have to put a lot up on it! I think what you've done has complimented its design. I love all the sparkle and I think the crown is my favorite piece! Donna, Gorgeous!! 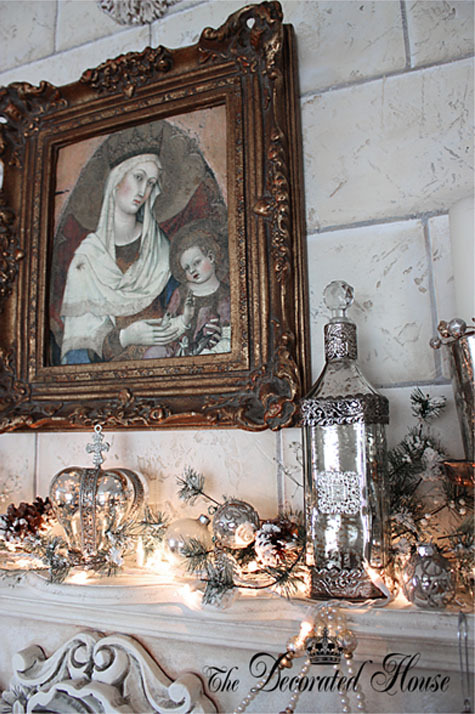 The mantel is so beautiful and I love the mercury glass and the painting. This mantle is EXACTLY what i want MINE to look like! oh my...sigh. Absolutely gorgeous. 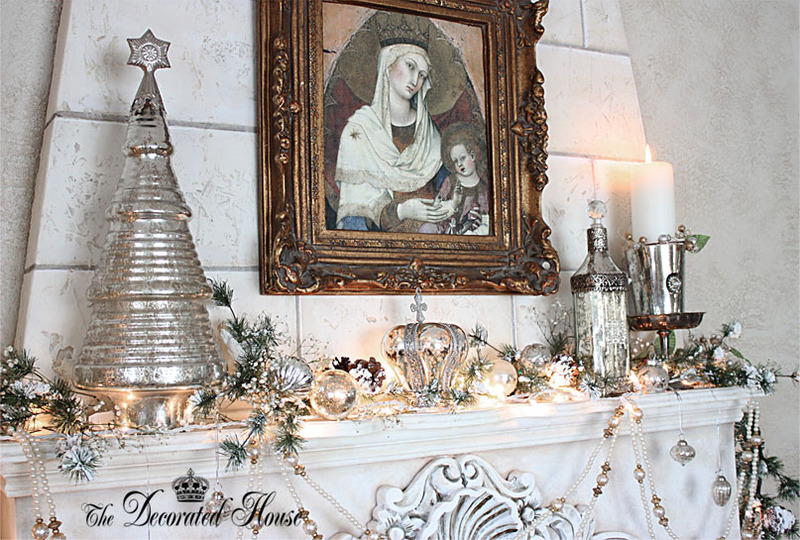 A winter wonderland right on your mantle. Do you remember where you found the crown? It's gorgeous. I'm so happy to know others love the Mercury glass as I do. It's so antique looking even when it's new. You are right Kathy in the past, when I put a lot more on this mantel, it might not have needed so much! Sally, sometimes I miss the colors that remind us of a children's style Christmas. No grand kids, but I bet one day I'll be happy some of the color decorations are still waiting in the boxes. Sue, the picture is a print of a very old painting. No memory of which artist painted it. Michelle thanks for your sweet compliment. You know how much I love your white and vintage decorating. Diane, I think the crown was from Marshall's. I haven't been to Home Goods in quite a while, but they may have had it as well. Your fireplace is just gorgeous. So happy to have seen you on here and be able to visit. Oh my goodness! I love all of your mercury glass and the patina of the silver! Absolutely beautiful! Love your Blog! I am a new follower. 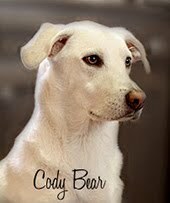 I found you on Pinterest and I am following you there too. Your home is delightful and I adore your mantle.